The quaintly named Coffeepot Drive members have all been in and around the London music scene for more years than they care to admit too; but those experiences and hard knocks have all come together to create this glorious sound. Edge of Town opens with a short Gospel song belted out to assorted handclaps before seamlessly sliding into the uproarious Fallback; which has all the hallmarks of something out of the Stax Vaults, and I defy you not to shake your hips when you listen to it for the first time. While most songs are quality funky Blues/Soul tunes; Coffeepot Drive sue aren’t one trick ponies; as the sensational Bayou proves. Sung from the very bottom of her heart Lady Oracle pleads over an acoustic guitar and piano on a song that Aretha would be proud to sing. For a working band from the mean streets of London Coffeepot Drive have a ‘big old sound’ and remind me of those bands like Delaney and Bonnie and Joe Cocker had behind them in the olden golden days. Predominantly a dirty Southern Soul sound; CPD flirt with the Blues and even a few soft Jazz runs here and there; and nothing sounds out of place; which is testament to the quality of the musicians involved and producer Andy Brook’s golden touch. With songs like Hey Suzy, Glass in My Mellow and Don’t Know Love in their armoury it’s no surprise to find the band have been regulars at Ronnie Scott’s legendary club in Soho London. 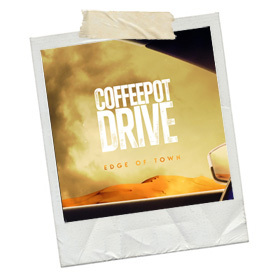 But the track that closes Edge of Town is the one that could and should get them national airplay and (fingers crossed) TV coverage. Killer really showcases Lady Oracle’s dynamic voice; as again she is only accompanied by a guitar, piano and a set of Angels masquerading as backing singers. I can think of half a dozen Pop Stars who have graced auditoriums around the country who can’t get close to the vocal range this young lady manages with ease on this one song. I’m not normally a fan of such things but the song (and therefore the album) ends with spontaneous applause from people in the studio; and it is genuinely deserved in this instance.